Blackreach was originally colonized by the Dwemer of Skyrim. They built Great Lifts to provide quick transport to the surface, and connected Blackreach to three of their settlements: Alftand, Mzinchaleft and Raldbthar. Irkngthand may also have contained an entrance, but it was no longer accessible as of 4E 201. 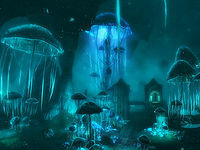 They constructed roads and buildings, culminating in the Silent City in the center of Blackreach. Dwarven Centurions were installed to guard the cavern's roads. The Dwemer farmed mushrooms in the damp environment. The Tower of Mzark, located in Blackreach, contained a device used to transfer the knowledge of an Elder Scroll onto a lexicon. Blackreach also acted as the lair of the dragon Vulthuryol. In the early First Era, the Dwemer took in Snow Elves seeking refuge from the invading Nords, but only if they blinded themselves. The Dwemer would later betray the Snow Elves by using them as slaves. They rebelled, overthrowing their Dwarven masters, and fleeing to the darkest corners of Blackreach. The cavern became the stage for the War of the Crag, a war fought between the Dwemer and Falmer for many decades. When the Dwemer disappeared from Tamriel in 1E 700, the devolved Falmer were free to spread throughout Blackreach. Over the centuries, the Falmer came to inhabit the abandoned halls of their former masters. By taming the Chaurus, they were able to use its chitin to create primitive camps, many of which were set up in Blackreach. The cavern remained largely unknown to the surface-dwelling people of Tamriel outside of scholarly texts. An adventurer named Obeth Arnesian was the first outsider reported to have discovered Blackreach. During the Second Era, Crimson Nirnroot from Blackreach was prized for its rarity and its use in alchemy. A Crimson Nirnroot specimen was housed in the Aldmeri Dominion vaults in Marbruk circa 2E 582. In 4E 58, the master alchemist Sinderion arrived in Blackreach to study the Crimson Nirnroot, having been directed there by Obeth. The Crimson Nirnroot was a variant of the common Nirnroot found exclusively in Blackreach, where it grows symbiotically with the cavern's mushrooms. Sinderion set up a field laboratory in one of the abandoned Dwemer houses, but he was then murdered by one of the still-functional Dwemer animunculi. In 4E 201, the scholar Septimus Signus sent the Last Dragonborn to Blackreach on a quest to retrieve the Dwemer's Elder Scroll. The Dragonborn also uncovered Sinderion's remains, and by collecting several samples of Crimson Nirnroot, was able to continue his research. Through use of the Thu'um, the Dragonborn awoke Vulthuryol. The two did battle, and the Dragonborn absorbed the dragon's soul.